The annual rate of UK inflation fell in August as the cost of petrol, food and non-alcoholic drinks declined. 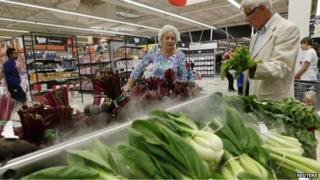 Consumer Prices Index (CPI) inflation fell to 1.5% from 1.6% in July, the Office for National Statistics said. It means the Bank of England remains under little pressure to raise interest rates in order to keep CPI inflation at or below its target rate of 2%. Retail Prices Index (RPI) inflation also saw a reduction, to 2.4%, from 2.5% the previous month. Prices of food and non-alcoholic drinks fell by 1.1%, marking their steepest fall for more than a decade. An ONS spokesman said competition between rival supermarket chains was a factor. Food prices had also been pushed up by cold weather a year earlier. Bucking the downward trend, clothing, transport services and alcohol all rose in price faster than the headline inflation rate. And core inflation, which strips out food, alcohol, tobacco and energy, notched up a 1.9% rate rise. "For all the chatter, guesswork and prophecy around possible rate hikes in the UK, inflation is currently sat at a five-year low," said Jeremy Cook, chief economist at currency exchange company World First. "Of course, the headline figure does not tell the full story. Core prices surprised higher by 1.9% in August; they were unaffected by the slips in oil prices or the 1.1% decline in food and booze through the past 12 months." Howard Archer, chief UK and European economist at IHS Global Insight, said: "August's muted consumer price inflation is welcome news for consumers' purchasing power as they currently continue to be hampered by very low earnings growth. "Indeed, even consumer price inflation of 1.5% in August is still more than double current underlying earnings growth." CPI inflation is still growing faster than average wages, which rose by just 0.6% in the three months to June from a year earlier. And advisory service Moneyfacts warned that with the Bank of England's benchmark interest rate still at 0.5%, savers were finding it difficult to get a decent return on their money. "Inflation may have fallen but thanks to the paltry interest paid on savings, it is actually making little difference to savers after the taxman has had his share," said Moneyfacts.co.uk editor Sylvia Waycot. There is some good news for consumers and motorists hidden in the inflation numbers. Food prices fell by 1.1% over the last year, the steepest annual fall in more than 10 years, thanks in part to intense competition between supermarkets. Fuel prices over the last four weeks have been at their lowest level for more than three-and-a-half years and that also feeds into other areas, as the cost of transporting goods is a big component of its price. This is the eighth month in a row that inflation has been below the Bank of England's target of 2% and means that there is less pressure on interest rate setters to start putting them up. However, inflation may be weak, but wage rises are even weaker. Pay rose just 0.6% over the last year, which means for most of us, there's more month left at the end of the money and not vice versa!